Classic look that won't have you mistaken for the wrong character! Who was on her way to her grandmothers house when...wait that's not right. Okay, now we've got it. There once was a young woman who pricked her finger...nope, never mind. Still not the right one. There once was a young woman who was called Cinderella. Almost, but there is something missing. Cinderella was a tough woman. The kind of person who put up with her cruel stepmothers, and stepsisters. She cooked, she cleaned, and she waited on them hand, and foot. But she remained positive. She remained kind, and loving. She was just as beautiful as she on the outside, as she was on the inside. Unlike her ugly stepsisters, who were beautiful only on the outside. There once was a woman who put on this Women's Classic Cinderella Costume. You! You put this costume on. That is what was missing. 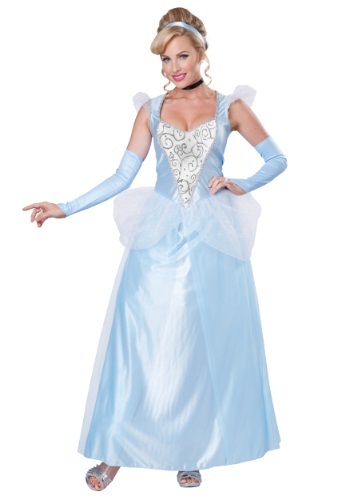 There once was a woman who put on this Women's Classic Cinderella Costume, and she was you. You are tough. You fight against cruelty with a kind smile. You remain positive in the face of adversity. Never do you think of becoming like the people you were trying to stand up to. You wont sink to their level. No, you will be happy with the prince of your choosing, and remain beautiful on the inside, as well as the outside.